Far, far away from the country’s super cities of the east is this pristine oasis in the Sichuan province, Five Flower Lake. Jiuzhaigou (or Jiuzhai) translates to 'Nine Villages Valley' after the nine Tibetan villages in the Minshan mountain range, seven of which are still populated today. 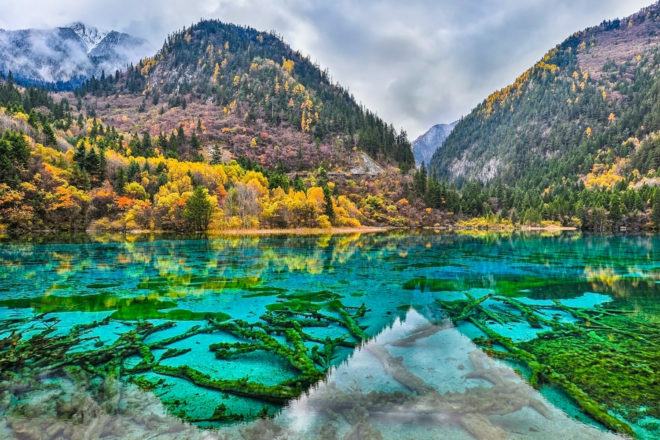 Five Flower Lake (pictured) is one of its main drawcards with ancient algae-covered trunks layering the crystal-clear lake floor, which owes its translucency to the high concentration of natural calcium carbonate. Incredibly, the bottoms of most lakes in the area are visible, no matter the depth of the water. But with the park stretching over 720 square-kilometres, there’s plenty more to explore: baby blue limestone ponds, tumbling waterfalls, hot springs and snow-capped peaks occupy the valley, which is home to the endearing giant panda and their slightly smaller, more energetic friend, the golden snub-nosed monkey. Getting about is easy – there’s 70 kilometres of eco-friendly wooden trails throughout the park, offering short strolls to three-day guided hikes. A pat on the back goes to UNESCO for declaring this a World Heritage-listed site back in 1992; as you gaze upon this hauntingly beautiful image with wide eyes it’s easy to understand why such beauty (and some of the clearest sky in China) should be preserved for future generations to see. Welcome to the incomprehensibly beautiful Five Flower Lake in the Jiuzhaigou Valley, China. Yes, you read that correctly: this is China. Far, far away from the country’s super cities of the east is this pristine oasis in the Sichuan province, eight to 10 hours from Chengdu. Jiuzhaigou (or Jiuzhai) translates to ‘Nine Villages Valley’ after the nine Tibetan villages in the Minshan mountain range, seven of which are still populated today. Five Flower Lake (pictured) is one of its main drawcards with ancient algae-covered trunks layering the crystal-clear lake floor, which owes its translucency to the high concentration of natural calcium carbonate. Incredibly, the bottoms of most lakes in the area are visible, no matter the depth of the water. But with the park stretching over 720 square-kilometres, there’s plenty more to explore: baby blue limestone ponds, tumbling waterfalls, hot springs and snow-capped peaks occupy the valley, which is home to the endearing giant panda and their slightly smaller, more energetic friend, the golden snub-nosed monkey. Getting about is easy – there’s 70 kilometres of eco-friendly wooden trails throughout the park, offering short strolls to three-day guided hikes. A pat on the back goes to UNESCO for declaring this a World Heritage-listed site back in 1992; as you gaze upon this hauntingly beautiful image with wide eyes it’s easy to understand why such beauty (and some of the clearest sky in China) should be preserved for future generations to see.